Can you keep a secret? Well, this is one of the greatest distortion/fuzz pedals ever built. Widely unknown, especially outside of the U.S., this old boy guarantees so much fun with almost any kind of guitar, single coil pick-ups preferred. 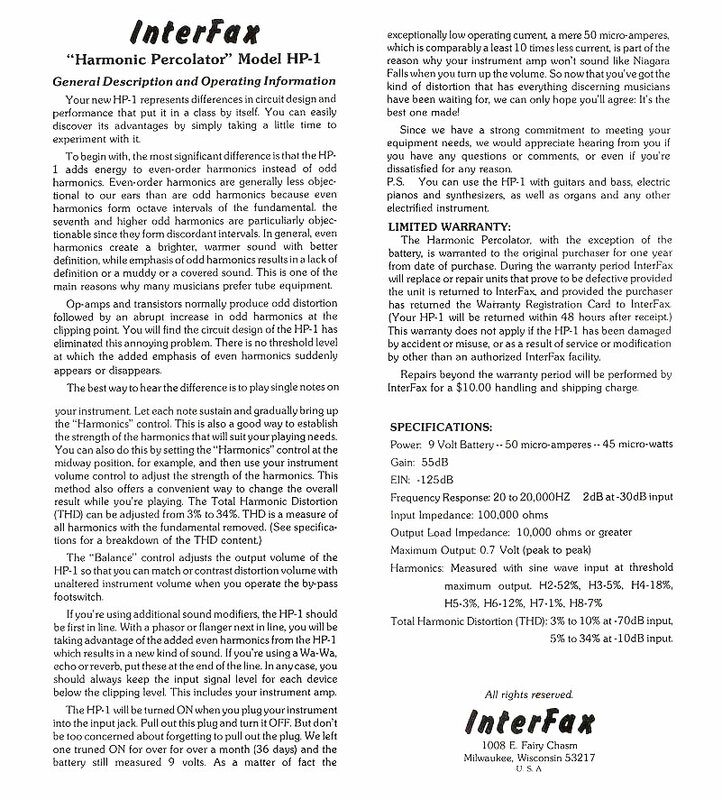 The Harmonic Percolator is a distortion pedal that was made in Milwaukee, Wisconsin in the 1970's in extremely small quantities by Ed Giese. Ed used a silicon NPN transistor and a germanium PNP transistor in a design that passes even order harmonics while suppressing odd order harmonics. According to Ed Giese (and my ears as well) these even order harmonics are more pleasing to the ear than odd order harmonics. There are also some variations on the circuit. Earlier pedals used a dual NPN silicon transistors arrangement, later ones NPN silicon and PNP germanium transistors. The parts Ed Giese used were obscured with epoxy. So the circuit became a mystery. This present reproduction of the pedal used all original obsolete and very hard to find parts that are necessary to give the Harmonic Percolator its unique tone. There are a couple of builders out there claiming they had the only true formula – but no one has ever succeeded to recreate the original percolator as accurate as the unknown builder of my unit (only hint: his initials SW). Only a very limited number of these pedals were available in 2010, all hand numbered. Mine is # 18. 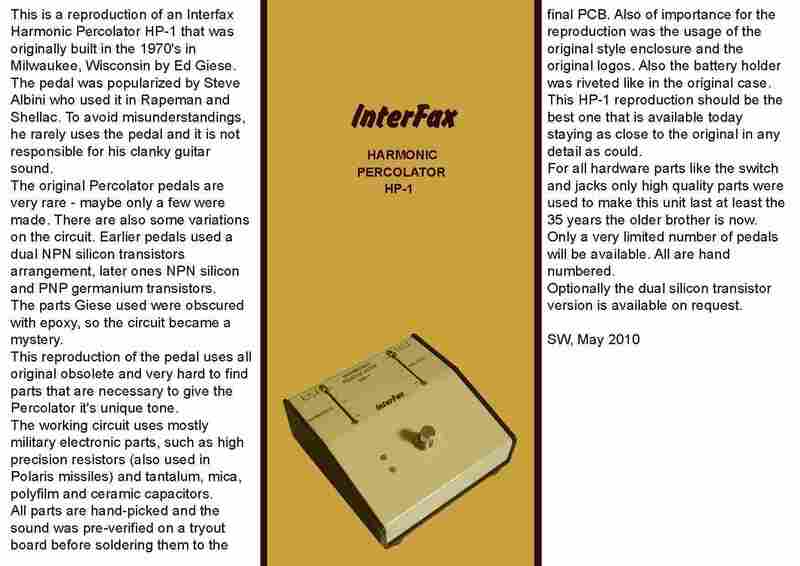 Of major importance for the reproduction was the usage of the original style enclosure and the original logo (“InterFax” as against “INTERFAX”, which is used on current re-issues). Also the battery holder was riveted like in the original case. Not that this is having influence on the great sound but it’s nice to see perfectionists at work. If you are with intent to buy a HP-1 today there are lots of boutique builders offering variants but only Chuck Collins (theremaniacs.com) is offering a close but not entirely faithful reproduction at high $$.